I’m very pleased that the Identity guzheng concerto will be performed by the China National Symphony Orchestra on November 13th in Beijing. The concerto will be included with a handful of other pieces for a concert celebrating the 150th birthday of Sun Yat-Sen. The CNSO had previously performed the concerto in 2011. To use the piece’s full name, Identity: Zhongshan Zhuang is a concerto for guzheng and orchestra that I wrote with Chinese producer/composer Victor Cheng. Since 2010 we’ve been fortunate enough to see it performed many times both in the United States and China, including by prestigious ensembles like the San Francisco Symphony and Chicago Sinfonietta. Guzheng virtuoso Su Chang has been our soloist since the very first performance, and she’ll be returning once again for this concert. It’s hard to find a better cause than an effort to fight brain tumors in children. I was honored to offer some of my film score cues for the informational videos of the Children’s Brain Tumor Project. More information about the foundation can be found here. Caitlin Downing Tribute – Children’s Brain Tumor Project from Really Interesting Picture Co. on Vimeo. My stage musical A Feast of Snacks is currently running at the Hollywood Fringe Festival. Feast is a collection of four short musical comedies, each about fifteen minutes in length. Most of the shows are award-winning graduates of various short play festivals around the world. Produced by Theatre Unleashed (of which I am a newly minted artist-in-residence), the production runs through late July. Showtimes and ticket information can be found here. If you’re in the area, I hope you can make it! I was interviewed by Goldstar, beloved purveyor of discount live event tickets, as part of their “Inspired By” series focusing on creative types. The questions focused on live performance, as that’s Goldstar’s raison d’être . To read my interview, just follow this handy link. I’m pleased to announce that Identity: Zhongshan Zhuang, the guzheng concerto which I wrote with Victor Cheng, recently added another US performance to its history. The Cape Symphony performed the concerto this past Saturday and Sunday, including it with a selection of pieces from or related to Asian cultures. As with every performance of the concerto to date, Su Chang returned as soloist. The Cape Cod Times said, she “plucked the multi-stringed guzheng robustly, creating an alluring sound-world, her vibrato extracting a vocalist’s texture from the instrument”. Our recording of the concerto is available on most digital music marketplaces, including Amazon and Apple Music/iTunes. 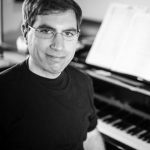 Orchestras interested in performing the piece can visit Janen Music Publishing for more information. I was pleased to team up with fellow composer Kyle Johnson and create original music for the Syrinscape sound pack “In Hell’s Bright Shadow”. Syrinscape is the licensed provider of audio accompaniment for Paizo’s popular Pathfinder tabletop RPG. Fantasy scores are one of my favorite genres of music, and hence I had a lot of fun with this project. The world-renowned San Francisco Symphony will perform Michael’s concerto for guzheng as part of a February Chinese New Year Concert. 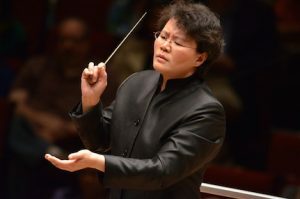 The concert will be conducted by Mei-Ann Chen, who also conducted the concerto last year with the Chicago Sinfonietta. Su Chang will join the Symphony as guzheng soloist. The concert will be on February 21st, 2015. More information can be found here. In May 2014 Michael’s concerto for guzheng and orchestra (“Identity: Zhongshan Zhuang”, co-written with Victor Cheng) continued its concert tour of the United States with two performances by the renowned Chicago Sinfonietta, under the baton of maestro Mei-Ann Chen. Guzheng virtuoso Su Chang returned as soloist. The concerto was programmed alongside a number of other orchestral works with European and Far Eastern folk music influences. Audiences were enthusiastic during both performances in Naperville and Symphony Center in downtown Chicago, breaking into applause even between movements. 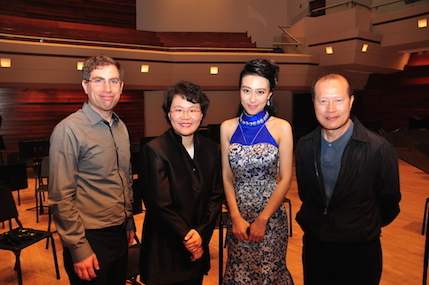 Michael Gordon Shapiro, Mei-Ann Chen, guzheng soloist Su Chang, co-composer/producer Victor Cheng.